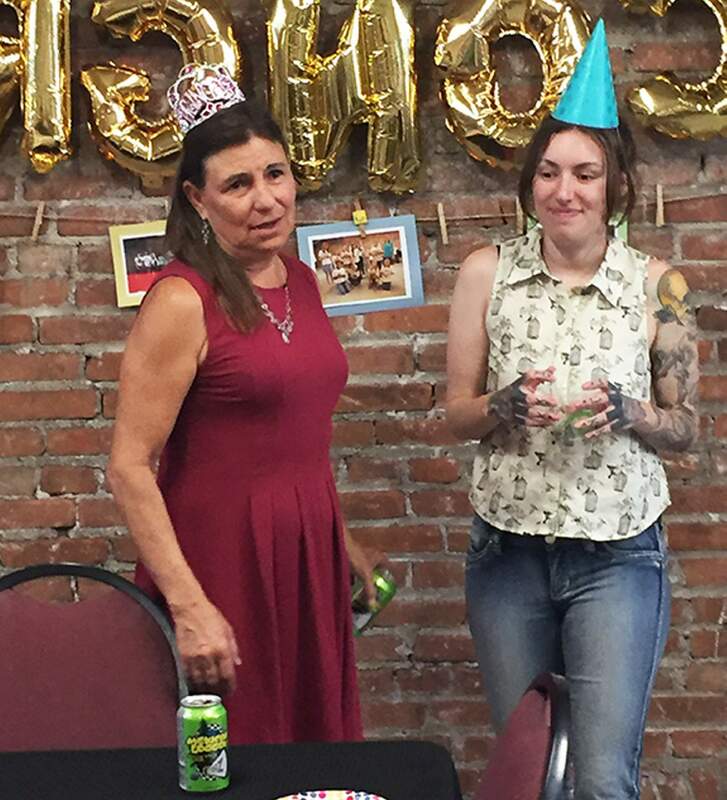 Guest of honor and outgoing Durango AC Education Director Sandra Butler, right, with her daughter Alicia Whiteman, celebrate Aug. 17. Master Gardener Marye Jackson celebrates at the Ohana Kuleana Community Garden Open House on Sunday. Last week, Durango’s creative community celebrated two women for their years of work as cultural midwives. The Durango Arts Center threw a big farewell party for Education Director Sandra Butler. Ohana Kuleana Community Garden held a summer open house purposefully on Marye Jackson’s 90th birthday. A community arts center and a community garden function as places for people to come together to create beauty and bounty. Over the past eight years, Butler virtually rebuilt DAC’s education program to include art classes for all ages and interests. It was Butler who first saw the potential in the brick-walled loft above the gallery. Her vision turned it into a multipurpose classroom, library and administrative office. Gifted as the coordinator of DAC’s illustrious band of docents, course innovator and general administrator, Butler is by humble self-assertion “fundamentally just a teacher.” And that’s where she’s headed next. Starting Monday, Butler will teach drawing at Fort Lewis College and Pueblo Community College as an adjunct professor. She’s done this before, but now she’s throwing all her energy into the college classroom. Last Friday, more than 50 people turned out for DAC’s farewell reception. Butler’s daughter, Alicia Whiteman, served as host and introduced Interim Director Jamie Wienck for a round of toasts. With tears in her eyes, Butler’s replacement, Deena Carney, acknowledged her mentor, guide and friend. With the DAC After School Program beginning Aug. 20, someone had to be in place right away, Butler said. The center is in transition as several other positions are still open. Former DAC Exhibits Director Mary Puller brought one of her famous cakes, a practice she has continued long after leaving DAC. Puller’s offering prompted Butler to suggest that all DAC applicants should be asked if they bake cakes. Last Sunday, Durango’s other cultural midwife-of-the-moment, Marye Jackson, was the guest of honor at Ohana Kuleana’s open house. Reluctantly, Jackson agreed to let the garden gods use her birthday as a foil for the gathering. It worked. More than 100 people strolled through the gardens, well exceeding the 75-person membership roster. Before OKCG, Jackson managed Shared Harvest Community Garden for seven of its 16 years. 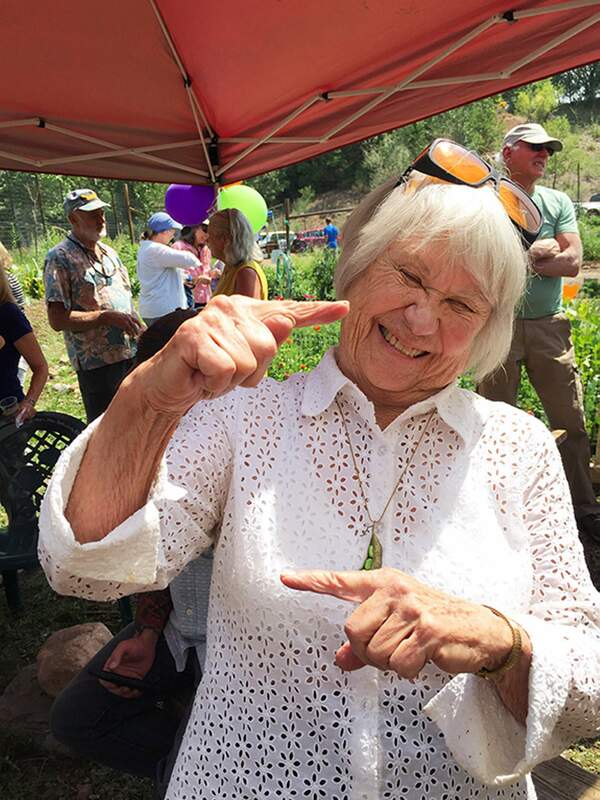 She started gardens at the DeNier Youth Center and local schools, most notably Riverview Elementary School, and is a retired board member of the Durango Botanical Society. In 2017, Jackson was named the Southwest Garden Project’s Volunteer of the Year. SolaVita Kombucha provided the home-made hibiscus-rose drink that served as the champagne-of-the-day. Butterscotch cupcakes baked by Jackson’s daughter, Nancy, were the pastry du jour. Jackson, master gardener and mentor to just about every Durangoan who has put a bulb in the ground, blushed and expressed deep gratitude to organizers and attendees.